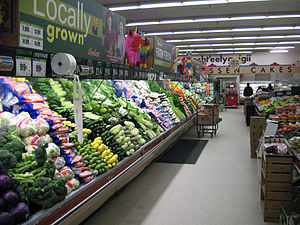 For Part 4 of Chuck Wendig’s 200-Word flash fiction challenge, I picked up on this story about a lost boy in a grocery store. My 200-word contribution is at the end. Enjoy! He had already looked in the frozen section. From there, he rushed past people toward the front of the store, past the pharmacy. “Anthony,” he yelled in a panic. At the end of the aisle, he looked frantically around the corner. Shoppers shuffled with their items and queued for purchase. Joe parted the people with his hands and maneuvered down the row of checkout lines. The lottery machines usually held Anthony’s interest. Each step, he squinted toward the machines, hoping to see the top of Anthony’s head appear. An elderly woman drove a motorized cart in his path, and he stopped just before knocking himself into the metal basket. A rush of warmth filled him. His stomach lurched. “Anthony,” he yelled in frustration. “Yes, actually,” he said, his gaze darting from the machines to the cart. He grabbed the front end of the cart and pulled it back, so he could quickly scramble around. As he approached the machines, he saw there was no small boy staring up at them and checking the flaps for freebies. “Anthony,” he yelled again, this time not as loud and much more desperately. He looked to the doors, then back into the aisles of the store. A man in a red vest worn by the store employees approached him. Joe looked at the concerned brow line of the employee. Joe’s eyes darted around the aisle full of shocked and concerned faces. He began to feel light-headed. The man in the red vest turned to another store employee standing next to him. The employee immediately headed to the front of the store. Joe was feeling his legs begin to weaken. The man noticed immediately and put his arm around Joe. “I think so,” Joe replied. The scattered murmurs from the people gathered vibrated inside of Joe’s head. A blonde woman in a store vest quickly approached Joe and the man. Moving alongside of her was another woman who looked to be a store customer. “Julie, are the police on their way?” Miers asked. “I think we should move this to the back of the store,” Julie responded. Miers and Joe both stopped walking. The female customer now standing next to Julie stepped forward and put her arm around Joe. The woman looked up at Miers. “What? Are you insane?” Joe looked at Kathy. “And who are you anyway? Look, I don’t know who she is, but I really need to find my son so if you don’t mind…” Joe said, turning from them and starting to look around again. “Joe, wait,” Kathy said, following him. Julie and Miers stood there, dumbfounded. “Joe, stop,” Kathy yelled, reaching for Joe’s arm. Suddenly, Joe’s hands started trembling and his eyes lost focus. He started remembering things in flashes. A lake. Sounds of tires screeching on pavement. Anthony screaming from the back seat. A broken windshield. An airbag in his face. “Mr. Ward, everything will be alright,” said a woman. “We’ll take your son in custody. Agent Porter will meet you at the hospital for debriefing. Don’t say anything to anyone until you speak to Agent Porter. Do you understand?” Joe remembered nodding to the woman he now remembered as Agent Manning. The woman who just told the store’s employees she was Kathy, his wife. Joe sat down hard on the store floor. He buried his face in his hands as the memories washed over him like it had all happened yesterday. He’d been through this before. Why were they doing this to him? Stealing his son again, week after week. It wasn’t fair. “Oh no, don’t be sorry,” Julie said. The two women turned away and lowered their voices. Joe glared up at them. He stood up and wiped his sweaty palms on his jeans. This had gone on long enough. The old woman in the motorized cart buzzed up next to him. “Did you find your son, Joe?” she asked. Joe looked down at her. He frowned. “Mrs. Davis?” he said. Yes, it was Mrs. Davis. How had he forgotten the woman who had been his next-door neighbor for half his life? This is a five-part challenge, so the next addition to this particular story should complete the story. Do you want to finish this one? If so, please post your final story to your blog and share a link here. Or, if you don’t have a blog but still want to play, add your 200-word ending to this story in the comments below. Also, a question for you: What would you title this piece? If you haven’t yet participated in Part 4 of the 200 Words flash fiction challenge, my original story Making Merry could use an addition. You may read the first three parts here. So, it appears that all Making Merry needs at this point is an ending. Care to write it? You brought back the lady in the motorized thingy!!! Great! Thanks.